This fantastic piece from Larry Elmore graced the opening pages of the Second Edition Advanced Dungeons and Dragons Player’s Handbook in 1989. 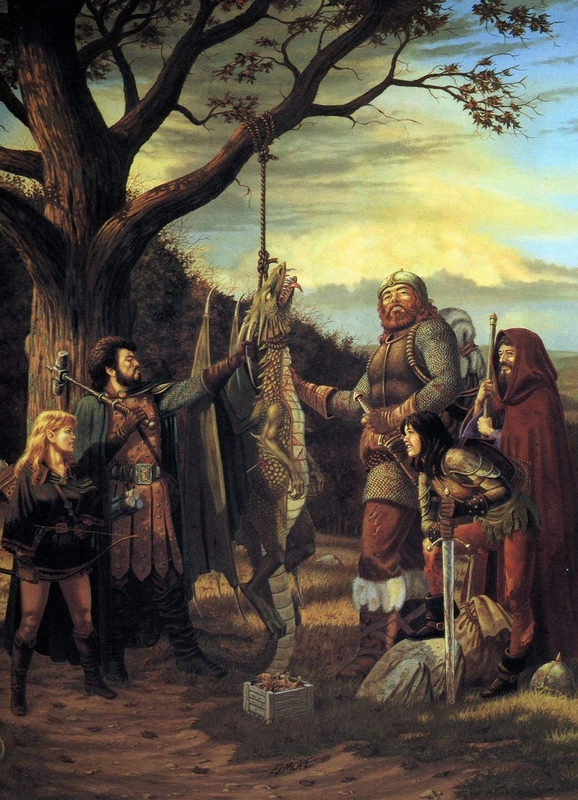 The second edition of AD&D met with a mixed reception, and has left a uneven legacy. But it came out when I hit my mid-teens and therefore was the D&D I knew very well transitioning into early adulthood. As a picture, it draws me in every time: These are adventurers I can believe in! Instead of being epic and heroically overblown, this quintet feels humble and real even if their company includes an elf and a wizard. They’ve had a hard fight, with some taking quite a drubbing… to defeat a dragon that’s the size of a lion rather than a legion. And the women are even reasonably dressed for adventuring*! These are adventurers not too far removed from you or I. Too often heroes are portrayed as something above and beyond us, but the truth is that anyone can rise to the occasion. A hero can live in any of us. Such characters with that touch of the everyday are those that inspire, and I love reading about them as much as I do writing them! Dragon Slayers And Proud Of It, by Larry Elmore. Click here for more of the artist’s work!